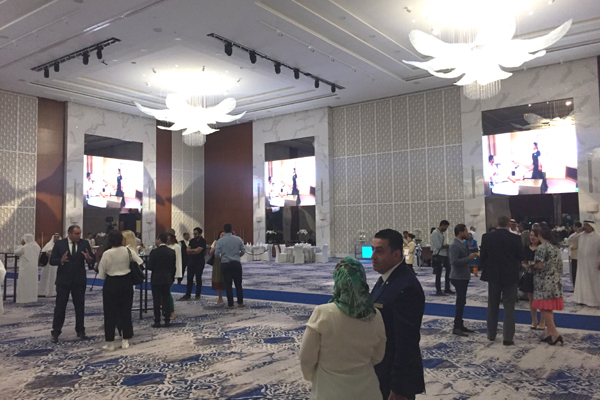 The Gulf Convention Centre, one of Bahrain's leading conference and exhibition venues located adjacent to the Gulf Hotel, unveiled a vibrant new look at its opening ceremony last night (October 21). Guests were greeted with an artistically remodelled foyer, complete with marble and wood finishes. Ahead, the Convention Centre's main hall, the Dana Hall, boasted an opulent look with a sophisticated colour palette of blue, white and brown. New additions in the hall include the installation of five video wall screens and audio equipment. The hotel's valued clients and media were treated to an evening of live music and performance as well as a spectacular showcase of one of the centre's key additions - the new crystal chandeliers. The gigantic flower-shaped chandeliers, which appeared to be floating above, rapidly switched colours during the live music performance, surrounding the audience in a sea of changing colours. The programme also featured a special wedding showcase. A model, dressed in an elegant white wedding gown, walked down the hallway, captivating guests as she made her way through the hall. The showcase was aimed at event and wedding planners as the centre seeks to position itself as a key destination for weddings and exhibitions as well. The main hall offers a seating capacity of up to 3,000 guests for cocktail receptions and 1,260 for an elegant banquet.